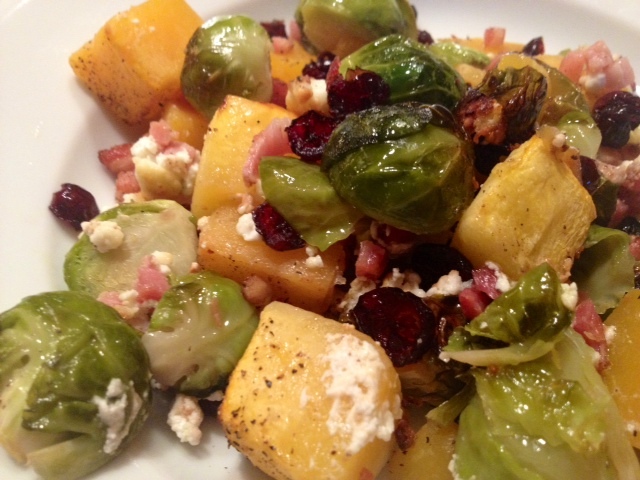 Roasted Butternut Squash & Brussels Sprouts. 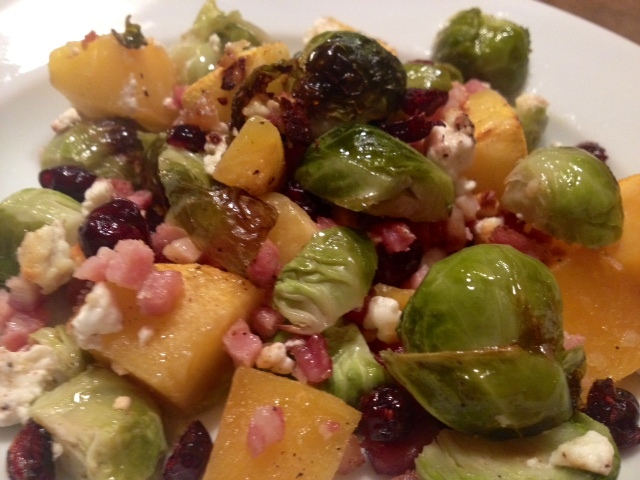 Roasted Butternut Squash & Brussels Sprouts With Goat Cheese, Pancetta & Dried Cranberries. 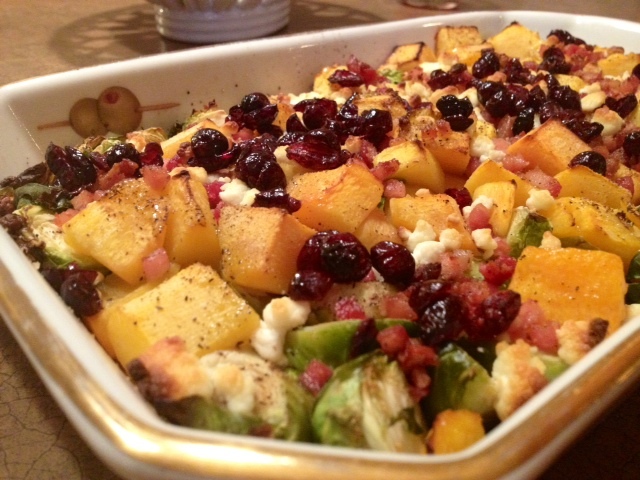 This is a great dish for Fall. It’s filled with healthy and hearty veggies and has a mouth-watering combination of sweet and salty flavors. 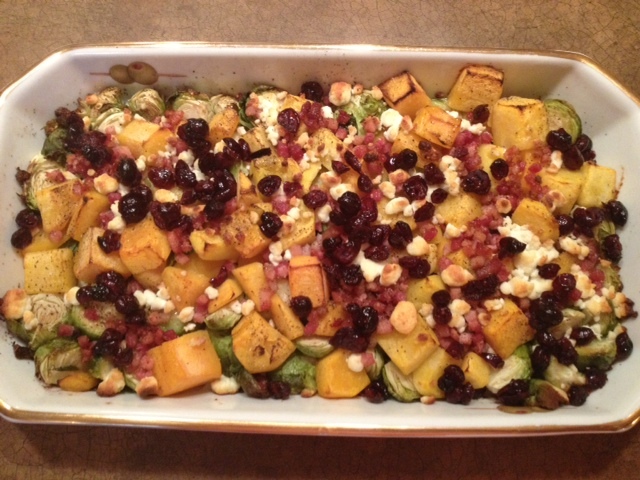 It works well as a side dish but is also filling enough to eat for a light meal. I’m definitely making this for Thanksgiving dinner this year! Begin by cooking the pancetta. I prefer to cook this beforehand in order to eliminate a lot of the fat. In a small non-stick pan, cook the pancetta on medium-high heat for about 5 minutes or until pink and crispy. Place the cooked pancetta on a paper towel to drain the excess oil. Spray a large baking dish with non-stick cooking spray. 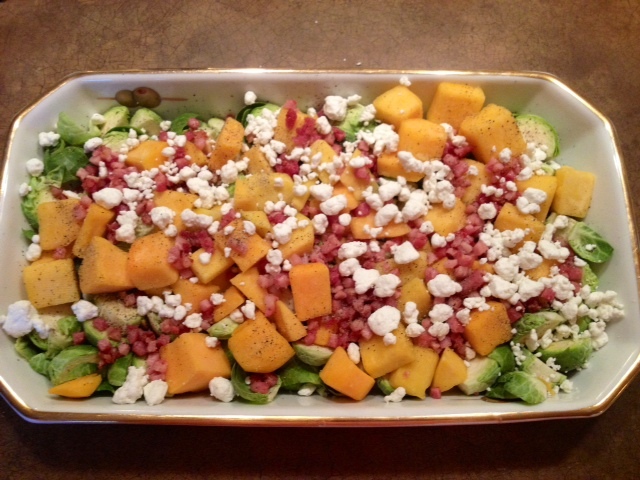 Put the Brussels sprouts on the bottom layer of the baking dish, then put the butternut squash on top. Sprinkle on the cooked pancetta and goat cheese and then season with a dash of salt/black pepper. Lastly, pour the olive oil evenly over top. Cook in a 400 degree oven for 30 minutes. After 30 minutes, remove from the oven to put the dried cranberries on top. Cook for an additional 10 minutes. ← Spinach, Artichoke & Sun-Dried Tomato Dip.